Post-race updates from the MX1 and MX2 classes at round nine of the 2018 Pirelli MX Nationals, direct from Gladstone in Queensland. 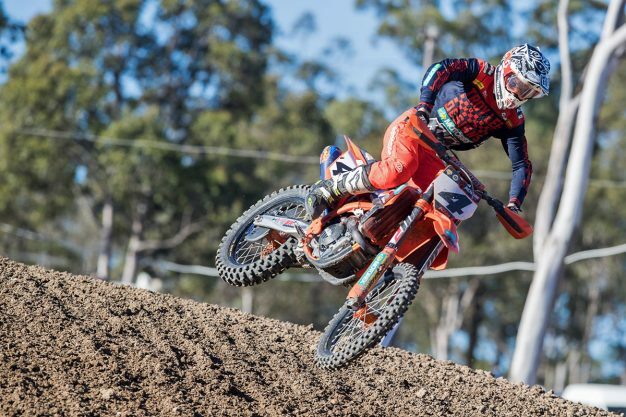 New Zealand champion Hamish Harwood (Davey Motorsports KTM) came out on top in a frantic opening MX2 moto for the round, holding Aaron Tanti (Complete Parts Kawasaki Racing) at bay to win by 2.306s. Third was an inspired ride from Jay Wilson (Yamalube Yamaha Racing) despite going down momentarily in the mid-stages, while teammate Richie Evans – leader of the moto at one point – registered a strong ride for fourth. 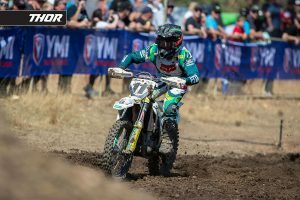 DPH Husqvarna’s Dylan Wills rode to fifth place, as the top 10 was completed by Wilson Todd (Serco Yamaha), early leader Jy Roberts (Husqvarna), Ricky Latimer (Honda Ride Red), Cody Dyce (Empire Motorsports Yamaha) and Jayden Rykers (Raceline Pirelli KTM). It was points-leader Todd who shot out front early, but went down on the opening lap and he had to fight hard to recover for sixth by race’s end. The luckless Kyle Webster (Penrite Pirelli CRF Honda Racing) was in contention during the opening portion of the race, however it appeared a bike problem caused him to plummet back to P19 in yet more disappointment for the Western Australian. CDR Yamaha Monster Energy Team’s Dean Ferris clinched the 2018 MX1 championship with a controlled victory in moto one, sealing the title with three motos to spare to make it a third crown in succession. Ferris was 3.195s ahead of a charging Brett Metcalfe (Penrite Honda Racing) across the finish, with Mitch Evans (Raceline Pirelli KTM) completing the podium in third. While Ferris took charge at the front, Metcalfe put in a strong challenge for the moto’s duration, however wasn’t able to draw close enough to make a move in the latter stages. Evans was a comfortable third, followed by Caleb Ward (Davey Motorsports Husqvarna) and Dylan Long (CDR Yamaha Monster Energy Team). Sixth came Kiwi Rhys Carter (Complete Parts Kawasaki Racing), edging a fast-starting Callum Norton in his first ride with DPH Husqvarna, while Luke Clout (KTM Motocross Racing Team) was P8 after a mid-moto mishap. Zak Small (Husqvarna) and Joben Baldwin (Yamaha) rounded out the top 10. 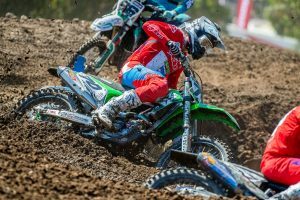 Red plate-holder Todd rebounded in the second MX2 moto of the round in central Queensland, fending off Wilson for a 1.563s victory in what eventuated as a two-rider race this afternoon. As a result, Wilson’s consistent 3-2 scorecard was enough to hand him an emotion-charged overall for round nine of the year. Behind them in race two, near 30 seconds in arrears, was a resurgent Webster ahead of Tanti, as Harwood bounced back from a minor fall to claim a deserved fifth. Sixth was another credible ride from Evans, as Dyce, Kale Makeham (Penrite Pirelli CRF Honda Racing), Rykers and Roberts were the top 10 finishers. Overall it was Wilson who scored his first round win since the 2015 season, joined on the podium by moto winners Harwood and Todd. It will be Todd that enters Coolum in the box-seat for the championship, which will go down to the wire next Sunday on the Sunshine Coast. 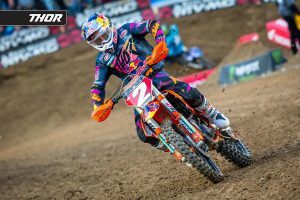 It was a dominant performance by newly-crowned triple premier class champion Ferris in MX1 moto two, powering to another hole-shot and accelerating away from the field. Ferris was virtually untouched today for a perfect round with the Super Pole, both race wins and the title, topping moto two by 9.434s ahead of ever-spectacular rookie Evans, with another 450 newcomer in Ward delivering a strong ride for third position. South Australian veteran Metcalfe was a lonely fourth this time around, with Long having a relatively uneventful day for fifth. Positions six through 10 were filled by Clout, Norton, Small, Corey James (KSF Ecstar Suzuki) and Baldwin. Overall for the penultimate round of the championship it was Ferris who won, joined on the overall rostrum by Evans and Metcalfe. Next up, Coolum’s championship finals on the Sunshine Coast of Queensland next weekend between 11-12 August.